When you have nice, new rims on your car, you won’t be the only one admiring them. Good-looking wheels draw the attention of car aficionados and thieves alike. Wheels are an easy mark for thieves. When you leave your car parked anywhere accessible, a thief can come remove your wheels with a simple set of tools like a lug nut wrench and a floor jack. In just a few minutes, they can make away with your wheels and tires, leaving you thousands of dollars out of pocket. Wheel locks, or locking lug nuts, can be installed to prevent wheel theft. 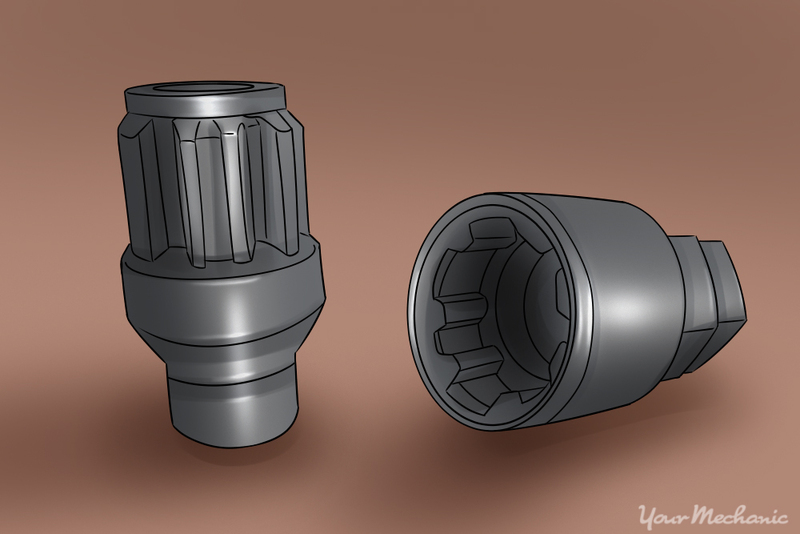 The lug nut or wheel stud is installed in the place of one of your original wheel nuts or studs on each wheel. The new locking lug nut has an abnormal shape that only fits with its wheel lock key. The wheel lock must be tightened and removed only with the specific wheel lock key, so a standard socket or lug nut wrench will not be able to remove the wheel locks. How do you remove the wheel locks from your car? What happens if your wheel lock key breaks or is lost? Follow these instructions to remove your wheel locks from your car. Warning: Never use power tools to remove the wheel lock from your car. The power tools exert too much force and can damage or strip the wheel lock of wheel lock key, rendering them useless. Step 1: Make sure your vehicle is in park. Engage the parking brake for extra security. Step 2: Align the key with the nut. Line up the splines on the wheel lock key and the wheel lock on the wheel. This is achieved by placing the wheel lock key on the wheel lock and turning it slowly until the tabs or design lines up. The wheel lock key will drop into place on the wheel lock. Step 3: Place your lug nut wrench on the wheel lock key. It is a six-point hexagonal head, and it should match the same size as the wheel nuts on your car. Step 4: Turn the lug nut wrench counterclockwise. This will loosen the wheel lock and may require significant force to loosen the wheel lock from the wheel. Step 5: Turn the wheel lock off by hand. Once the wheel lock is loosened, you should be able to turn the wheel lock off by hand easily. If you are installing the wheel lock again, perform this procedure in reverse. Method 2 of 2: Remove a wheel lock without a key. In this procedure, you’ll use a universal wheel lock removal tool to take the wheel lock off. It will most likely damage the wheel lock which you won’t be able to reuse. Be sure you don’t have the wheel lock key somewhere before using the universal kit. Step 1: Put car in park. Engage your car in park and apply the parking brake. This prevents a rolling motion when you try to loosen the wheel lock. Step 2: Find the right wheel lock removal tool. Test-fit the tool overtop of the wheel lock you need to remove. It needs to fit snugly, and the teeth on the inside of the removal socket need to bite into the wheel lock. Step 3: Hit the tool with a mallet. Firmly hit the end of the wheel lock removal tool with the rubber mallet. You need the wheel lock removal tool to be firmly stuck on the wheel lock.The teeth inside the wheel lock removal tool are now digging into the wheel lock itself. Step 4: Loosen the wheel lock. 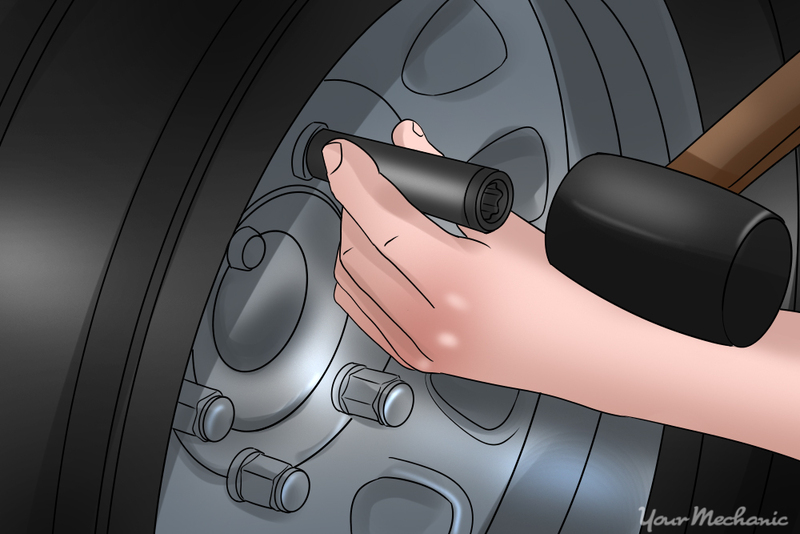 Loosen the wheel lock by turning the removal tool counterclockwise with your lug nut wrench. Expect that it will take significant effort to loosen the wheel lock. Step 5: Finish turning by hand. Once the wheel lock is loosened, you should be able to turn it off the rest of the way by hand. The wheel lock will be stuck in the removal tool. Step 6: Remove the lock from the tool. Put a punch or screwdriver through the hole in the wheel lock removal tool against the wheel lock and hit the punch with your mallet. After a few hits with the hammer, the damaged wheel lock will pop out. Note: Sometimes the lug nut will need to be held in a vise and removal tool turned clockwise to get lug nut out of the tool. Step 7: Repeat for the remaining wheel locks. Perform the same process on any other wheel locks as needed. If you are installing a new set of wheel locks, be sure to put the wheel lock key in a place you will be able to find it. The glove box, center console, or with your tire jack are good places for the wheel lock key. This way, the process will be as easy as possible. If you think you need a wheel bearings replacement or need help tightening the lug nuts, have one of YourMechanic’s mobile technicians give you a hand. Q: Car doesn't always start.